Update: The myRA is being discontinued. A new retirement account, myRA, has was launched. It's designed as an entry point to retirement savings, like a couch-to-5K training program is for runners. It wasn't meant to change a new investor's life immediately but to encourage savings habits. The account offered an easy to get people to start saving for retirement in hopes they'll continue after they've accumulated a few thousand dollars but no more than $15,000. However, about three years after its introduction, the U.S. Department of Treasury is phasing out the program. Getting started saving for retirement isn't complicated, whether you're using a myRA, a self-directed IRA, or investment advisor. But the process can be intimidating. In fact, the Federal Reserve Board has reported that 31% of non-retirees don't have any retirement savings. In addition, over 50% of those with self-directed retirement accounts (where the retirement saver chooses the investments) were either not confident or only slightly confident in making investment decisions. The myRA was designed to take away the intimidation of investing by eliminating the need for making investment decisions. All money is invested in a U.S. Treasury savings bond so none of the investment principal is at risk. There are no investment fees, account maintenance fees, or sales charges, so all the principal is invested. The bond pays interest at the same rate of the Government Securities Investment Fund (or G Fund), which is offered to government employees. This amount is fairly low (2.31% in 2014; 3.19% over the past 10 years). So there is a risk that the investment return may not keep pace with inflation. But account owners don't have to worry about losing money. There is no minimum for the initial investment and subsequent investments. Setting up a myRA is was pretty easy. Go to the myRA.gov website sponsored by The United States Department of the Treasury and respond the prompts on the enrollment page (click on the “Sign up today” button). With the payroll deduction, I'll most likely need to set up recurring contributions. With the tax refund, I could make a one-time contribution (though I could contribute every year if I met income guidelines). With the checking and savings accounts, I might make one-time or recurring contributions. The only warning I'll make is for high earners: I could possibly fund an account that I couldn't maintain because my earnings disqualified me from putting money in the account for a certain year. 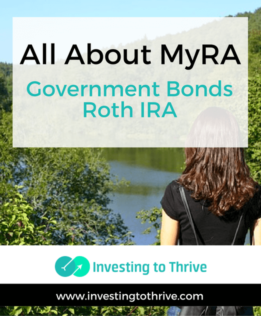 Note that the contribution rules are the same as the Roth IRA because myRA is a form of a Roth IRA. Generally, though, this account was for workers who make much less than Roth thresholds. The myRA was designed for lower income earners and those who don't have a retirement plan at work. However, anyone who has never had a myRA before could participate. I've read that the myRA follows similar rules as the Roth IRA. That's because it is a Roth IRA. However, there's now a distinction between a myRA (what I am now calling a public-sector Roth IRA) and a private-sector Roth IRA. Further, the myRA has unique features that distinguish it from a private-sector account. As tax laws regarding Roth IRAs change, expect to see modifications to the myRA. For example, if annual contribution limits are increased for the Roth IRA, then the myRA limits should increase also. For example, I could open an account with a brokerage firm such as Schwab, Fidelity, or Vanguard; or start an account with a robo-advisor such as Betterment or WealthFront. Then, I could choose investments such as Vanguard funds or a pre-designed portfolio. I don't have to wait until I have $15,000. I could move money out of the account into a private-sector one much sooner, and now account holders will need to move money sooner rather than later. The myRA offered an easy way to get started saving for retirement. At this time, a new retirement saver may should investigate ways to move money to a private-sector, self-directed account. Do you have a myRA? Have you moved your money yet?